The PM10, or particulate matter, data for Belagavi shows that where the National Ambient Air Quality Standards should have been 60, the air we breathe in Belagavi has 66 PM10 levels. The WHO standard is far lower at 20. Every single day, we breathe polluted air way beyond permissible standards for our health. Several reports had been published over the years about the abysmal state of air pollution in the country. The latest Greenpeace report also mentions the same. None of the Indian cities complies with standards prescribed by the World Health Organization (WHO) on air quality, stated a report of Greenpeace, global NGO working on environmental issues. Karnataka, like many other cities, has not met the WHO and the National Ambient Air Quality standards. The report, which has assessed air quality in 168 cities across 24 states and Union territories, pointed out that fossil fuels are one of the main culprits for deteriorating air quality. 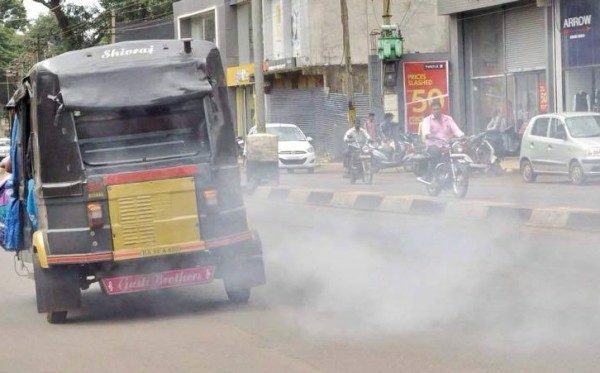 The pollution levels in cities in Karnataka showed that particulate matter-10 (PM10) was higher than the annual average of 60 g/m3 (60 micrograms per cubic metre) as prescribed under the US National Ambient Air Quality Standards. The levels of PM10 in the atmosphere in Davanagere, Bengaluru, Tumakuru, Riachur and Hubbali were at 109, 119, 118, 87 and 80 g/m3 for 2015-2016. According to Green Peace, the air pollution levels for cities in Karnataka highlighted that PM10 were higher than the annual average of 60 µg/m3 as prescribed under NAAQS. Levels of PM 10 in the atmosphere in Davanagere, Bengaluru, Tumkur, Riachur and Hubbali were respectively 109, 119, 118, 87 and 80 µg/m3 for year 2015-2016. For those who do not understand the different levels of pollution: Visible smoke is comprised of particles of PM10 size or larger. The particles with the greatest health effects are those within the “respirable range”, that is between PM10 and PM0.1. The respirable range contains particles that can penetrate deep into the lungs and deposit there; particles smaller than PM0.1 are usually exhaled. Fine and ultra fine particles (PM2.5 and PM 0.1) are not visible to the eye (2.5 microns is approximately 1/30th the size of a human hair). 1.6 Million more people die due to air pollution in India and China according to Greenpeace, India. Why to blame authorities again ???? Sudhir did you do regular PUC of your vehicles??? Even 10% Belgaumities are not doing so!! Be an honest citizen. It’s a wroth noting that the pullution board has failed to take the necessary steps to control the air pollution in the City. Hopefully the coming days the concerned authorities to act in matter. Thanks for the Post it will create awerness in public.